This problem happens in untinted windows when birds do not see the glass. Bird strikes also happen in reflective windows when the reflected tree, sky, and clouds indicate free space to fly. Upon impact, some birds die instantly, some are stunned on impact, others are able to fly away, but may suffer from internal hemorrhagic damage. With millions of bird strike accidents happening around the world, this is quite a real problem. The Temple University estimates 800-1,000 bird strike deaths this year alone. Multiply that by the hundreds of thousand other communities around the world, we are easily talking about millions of un-needed bird deaths each year. If preventing bird strikes are on your mind when purchasing home tint, we recommend films with lower exterior reflectivity percentages. You want to avoid highly transparent or highly-mirrored glass, these are the extremes in window film. A good mid-point would be a film with exterior reflectivity of 10-20%. For example, SolarGard Truevue film retains 61% solar energy rejection with a low reflectivity of 22%. ASWF Moonlight also offers low reflectivity at 12% for solar rejection of 60+%. Unfortunately, there are not many window film products that were designed specifically to warn birds away from windows for buildings along migratory bird highways. CollidEscape Film uses film similar to signage film that has many small holes for transparency. This film is applied to the exterior of a window and allows interior view to be adequate. From the exterior, the window is opaque to protect from bird strikes. OrniLux utilizes a band of UV light that is visible to birds (invisible to humans) to warn them away from windows. This technology is offered as a glazing solution to the window manufacturing process rather than a film itself. 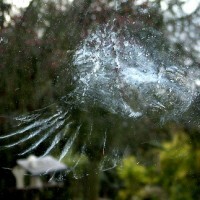 Professor Daniel Klem, an expert in bird strike, has been urging Llumar films to make a bird-safe window film product in 2009, but ultimately, TC does not know if Llumar has offered such a product to their lineup. In summary, if bird strikes happen in your area, consider purchasing home tint with low reflectivity from 10-20%. This prevents the film from being too transparent, or too reflective. Both conditions are dangerous to birds.